Exciting developments on George Calombaris' venture into Brunswick East. From John Lethlean's original mention of it being 'along Lygon St from Rumi', I picked out a shop being renovated near the corner with Edward St as my predicted location. But no! Excitingly, he's venturing further north than that. The folks at Republic of Moreland were onto this last month and there is now signage on the site to confirm it: Calombaris will be opening his Hellenic Republic taverna on the corner of Stewart St, at the site of the old cheesecake shop. There's a lot happening on that strip: Each Peach and Vege2Go are two of the newer proponents, and with the traffic a new Calombaris venture will guarantee it will be interesting to see where we go from here. In other local news, Artisan Espresso, which opened in April and had caffeinatics abuzz with its dedicated coffee cafe and accessible roasters, has closed for now, but my understanding is that one of the owners intends to re-open on the same site. Update: The Brunswick East Project is now open (Tues-Sun) at the Artisan Espresso site. 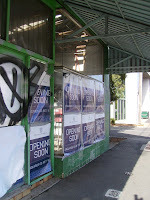 Do you know which of the owners of Artisan Espresso will be re-opening at the same site? Joshua, the coffee roaster or Marinas, the caterer? No, I don't know which way round it's going, unfortunately. It's Maranis. It's a great friendly place. Wonderful muffins also, the best I've had in Melbourne.